Majesco offers the Wii owner another chance to use the rarely exploited Wii MotionPlus add-on with its new, to-the-point Swords, a game that is about swords, time traveling, and swords. In Swords, players will engage eight sword-wielding foes "including the flirtatious yet dangerous beauty Keiko Anamura, the vicious Viking chieftain Armin, [and] the famed Sir Lancelot of the Round Table" while wielding an upgradeable sword of their own. Players will also "travel through time and space" to fight foes, making Swords feel like a spiritual sequel to Time Killers, only with fewer chainsaws and way more swords. 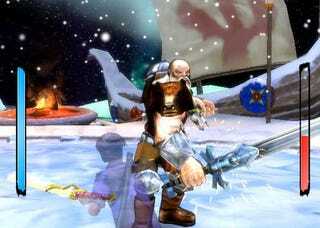 For battles more intense than one might find in Wii Sports Resort, Swords also lets players go head to head against a friend and slice their way through a flood of zombies. Swords is being developed by Panic Button, the team responsible for Wii titles Lumberjacks and We Wish You A Merry Christmas, so set your expectations to "high."